The commentary, analysis, references to, and performance information contained within Morningstar® DividendInvestor℠, except where explicitly noted, reflects that of portfolios owned by Morningstar, Inc. that are invested in accordance with the Dividend Select strategies managed by Morningstar Investment Management LLC, a registered investment adviser and subsidiary of Morningstar, Inc. Throughout the newsletter, references to “Morningstar” refer to Morningstar, Inc.
Morningstar Investment Management manages portfolios using similar investment strategies for clients as part of the Morningstar® Managed Portfolios℠ program. The Morningstar Managed Portfolios program is offered by the entities within Morningstar’s Investment Management group, which includes subsidiaries of Morningstar, Inc. that are authorized in the appropriate jurisdiction to provide consulting or advisory services in North America, Europe, Asia, Australia, and Africa. In the United States, Morningstar Managed Portfolios are offered by Morningstar Investment Services LLC or Morningstar Investment Management LLC, both registered investment advisers, as part of a discretionary investment advisory service or as model portfolios to third-party advisory programs on a discretionary or non-discretionary basis. Portfolio construction and ongoing monitoring and maintenance of the portfolios within the Morningstar Managed Portfolios program is provided on Morningstar Investment Services’ behalf by Morningstar Investment Management. In the United States, Morningstar Managed Portfolios are intended for citizens or legal residents of the United States or its territories and can only be offered by a registered investment adviser or investment adviser representative. Morningstar Investment Management does not guarantee the results of its advice or recommendations, or that the objectives of a strategy will be achieved. Morningstar’s Dividend Select portfolios and the portfolios offered by Morningstar Investment Services or Morningstar Investment Management may not have contained and/or may not currently contain the same underlying holdings and may have been and/or may currently be managed according to rules or restrictions established by Morningstar. Opinions expressed are as of the current date and subject to change without notice. Morningstar, Inc. and Morningstar Investment Management shall not be responsible for any trading decisions, damages, or other losses resulting from, or related to, the information, data, analyses or opinions contained herein or their use, which do not constitute investment advice, are provided as of the date written, are provided solely for informational purposes and therefore are not an offer to buy or sell a security. This commentary is for informational purposes only and has not been tailored to suit any individual. References to specific securities or investment options should not be considered an offer to purchase or sell that specific investment. Employees of Morningstar or its affiliates may have holdings in the stocks shown herein. All data presented is based on the most recent information available to Morningstar as of the date indicated and may not be an accurate reflection of current data. There is no assurance that the data will remain the same. This commentary contains certain forward-looking statements. Forward-looking statements involve known and unknown risks, uncertainties and other factors which may cause the actual results to differ materially and/or substantially from any future results, performance or achievements expressed or implied by those projected in the forward-looking statements for any reason. The performance shown herein should in no way be considered indicative of, or a guarantee of the actual or future performance of, or viewed as a substitute for any portfolio invested in a similar strategy. Performance data shown represents past performance which does not guarantee future results. Performance shown for Morningstar’s Dividend Select portfolios on pages 4 and 9, and the gross-of-fees performance for the model portfolios managed by Morningstar Investment Management on pages 22 and 23, does not include the deduction of advisory fees or other expenses normally incurred in the management of a portfolio. Performance shown for Morningstar’s portfolios does include the deduction of commissions. 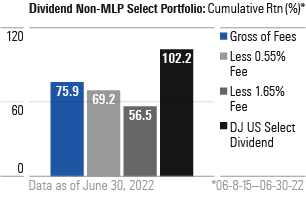 Reinvestment of all dividends and master limited partnership (MLP) distributions is assumed, although they may not be reinvested into the stock or unit that paid the dividend or distribution. The effects of taxation, other than foreign tax withholdings that may be applied to foreign stocks, are not taken into account. If these fees and expenses were included, the performance shown would be lower. On pages 22–23, performance is shown for the model portfolios managed by Morningstar Investment Management in two additional ways. One includes an annual advisory fee of 0.55, which is the maximum advisory fee that could be charged by Morningstar Investment Services for portfolios invested in the Dividend Select strategies through its discretionary Morningstar® Managed PortfoliosSM program. The other includes an annual advisory fee of 1.65, which includes Morningstar Investment Services’ maximum annual fee plus a maximum annual advisory fee of 1.10 that could be charged by a financial advisor utilizing the Morningstar Managed Portfolios program with his or her clients. Performance is based on a stock’s market price as of the close of trading on the last business day of the month and is calculated using a time weighted, geometrically linked rate of return formula. Returns for periods longer than one year are annualized. Results achieved by an investor using a similar strategy may differ substantially from the historical performance shown herein, and may include the portfolio incurring a loss. Common stocks are typically subject to greater fluctuations in market value than other asset classes as a result of factors such as a company’s business performance, investor perceptions, stock market trends and general economic conditions. American Depositary Receipts (“ADRs”) are foreign stocks listed on a U.S. exchange. Investment risks associated with ADRs and foreign stocks include, but are not limited to, currency, inflationary, and liquidity risks as well as the risk of adverse political, economic and social developments of the underlying issuer’s home country. The underlying issuers of certain ADRs are under no obligation to distribute shareholder communications to ADR holders, or to pass through any voting rights with respect to the deposited securities. Dividends are not guaranteed and are paid at the discretion of the stock-issuing company. Benchmark performance represents the return of an index consistent with the strategy’s asset allocation and is provided as a reference only. Indexes are unmanaged and are not available for direct investment. The S&P 500 Index is a market capitalization-weighted index composed of the 500 most widely held stocks whose assets and/or revenues are based in the U.S. It is often used as a proxy for the U.S. stock market. The Dow Jones U.S. Select DividendTM Index is an annual dividend weighted index composed of 100 stocks. It is used as a proxy for the U.S.'s leading stocks by dividend yield. Portfolio tables include a list of all holdings in the Morningstar Dividend Select and Dividend Select Deferred portfolios as of the date indicated. This information is subject to change at any time. The Investment Theses and Latest Thoughts section includes the editor’s analysis and/or rationale for including each stock in Morningstar’s Dividend Select and Dividend Select Deferred portfolios. All opinions are those of the editor, and may include forward looking statements. Research Roundup is a sampling of Morningstar’s equity research analysis and notes for the Dividend Select and Dividend Select Deferred portfolios’ current holdings published since DividendInvestor’s last publication date. Analyst notes chosen for inclusion are prioritized based first on changes in moat ratings, then on changes in fair value uncertainty ratings, and then on changes in fair value estimates. Income Bellwethers contains 100 companies that are selected on the basis of their potential appeal for income-oriented investors. Selection criteria includes Morningstar, Inc. economic moat ratings of narrow or wide, dividend yields that typically exceed that of the S&P 500, and company size as measured by market capitalization. Individual companies may or may not be potential candidates for purchase in the Dividend Select or Dividend Select Deferred portfolios, and are included for informational purposes only. 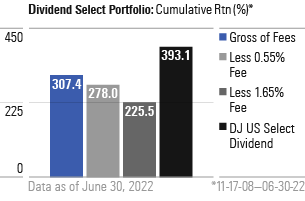 The Portfolio Focus section contains Morningstar, Inc.’s analyses of several stocks that are currently held in the Dividend Select and/or Dividend Select Deferred portfolios. Companies are rotated on a regular basis with the intention that each holding will appear at least once per calendar year. The contents of these sections have been previously published on Morningstar.com or Morningstar Select, and have been edited for length. Morningstar’s analysis is provided for informational purposes only and is not investment advice or an offer to buy or sell a security. Morningstar Investment Management may have different opinions and has not independently verified the accuracy of the information published by Morningstar, Inc. You should not assume that investments in the securities identified and discussed were or will be profitable. Securities identified in DividendInvestor, to the extent that they reflect holdings of Morningstar’s Dividend Select and/or Dividend Select Deferred portfolios, do not include all of the securities purchased, sold, or recommended by Morningstar Investment Management for Morningstar’s portfolios. You should not assume that investments in the securities identified and discussed were or will be profitable. Annual Dividend per Share is the amount of dividends paid by the company in a year divided by the number of outstanding shares. Dividend Growth measures the growth of company dividends over the past five fiscal years. It is the compounded growth rate between the dividends paid out over the most recent trailing 12 months and the dividends paid out over the trailing 12 months six years ago. Growth in dividends is usually a signal that management has confidence in the company's continued earnings power. Dividend Yield is a measure of the dividends per share of the company over the trailing one-year period as a percentage of the current stock price. Earnings per Share, or EPS, is how much profit a company has made per share within a given period. Comparing a company’s most recent EPS to its EPS in previous years and quarters (adjusted for any splits) is one of the most common ways of telling how fast the company’s profits are growing. Earnings per Share Growth represents the annualized rate of net-income-per-share growth over the trailing one-year period for the stocks held by a fund. Earnings-per-share growth gives a good picture of the rate at which a company has grown its profitability per unit of equity. All things being equal, stocks with higher earnings-per-share growth rates are generally more desirable than those with slower earnings-per-share growth rates. One of the important differences between earnings-per-share growth rates and net-income growth rates is that the former reflects the dilution that occurs from new stock issuance, the exercise of employee stock options, warrants, convertible securities, and share repurchases. Fair Value Estimate is a proprietary Morningstar data point that displays a Morningstar analyst's estimate of what a stock is worth. Each stock's fair value is estimated by utilizing a proprietary discounted cash flow model (DCF). This model assumes that the stock's value is equal to the total of the free cash flows of the company is expected to generate in the future, discounted back to the present at the rate commensurate with the riskiness of the cash flows. As with any DCF model, the ending value is highly sensitive to Morningstar's projections of future growth. Fair Value Uncertainty is meant to give investors an idea of how tightly Morningstar feels they can bound their fair value estimate for any given company. To generate Morningstar Fair Value Uncertainty, Morningstar, Inc. analysts consider the following factors: sales predictability, operating leverage, financial leverage, and a firm's exposure to contingent events. Based on these factors, analysts classify the stock into one of several uncertainty levels: Low, Medium, High, Very High, or Extreme. The greater the level of uncertainty, the greater the discount to fair value required before a stock can earn 5 stars, and the greater the premium to fair value before a stock earns a 1-star rating. The Five-Year Growth Forecast is the estimate of the annual earnings per share growth rate for the next five year. Free Cash Flow per Share is operating cash flow minus capital spending. Free cash flow represents the cash a company has left over after investing in the growth of its business. Young, aggressive companies often have negative free cash flow, because they’re investing heavily in their futures. As companies mature, though, they should start generating free cash flow. Free Cash Flow per Share Growth is the percentage change in the Free Cash Flow per Share from the previous year. Free Cash Flow per Share is calculated by dividing free cash flow by the number of shares outstanding. Free Cash Flow Yield is free cash flow divided by revenue. The value of a company as determined by the market price of its outstanding common stock. It is calculated by multiplying the market price as of the close of trading as of the last day of the most recent month-end by the number of shares outstanding as of the most recently completed fiscal quarter. It may be used as an indicator of how investors value a company's future prospects. Moat Trend reflects whether the underlying sources of a company’s competitive advantage (or potential sources of advantage) are improving over time (positive moat trend), weakening over time (negative moat trend), or neither strengthening or weakening (stable moat trend). A company may also get a negative moat trend if they face a substantial competitive threat that is growing. Moat trends tend to change more frequently than economic moats. The idea of an economic moat refers to how likely companies are to keep competitors at bay for an extended period. The following attributes can give companies a wider economic moat: huge market share; low cost producer; patents, copyrights, or governmental approvals and licenses; unique corporate culture; high customer-switching costs; and network effect. A company can be rated as having no economic moat, a narrow economic moat, or a wide economic moat. The Morningstar RatingTM for Stocks is a forward-looking, analyst-driven measure of a stock's current price relative to the analyst's estimate of what the shares are worth. Stock star ratings indicate whether a stock, in the equity analyst's educated opinion, is cheap, expensive, or fairly priced. To rate a stock, an analyst estimates what he thinks it is worth (its "fair value"), using a detailed, long-term cash flow forecast for the company. A stock's star rating depends on whether its current market price is above or below the fair value estimate. Those stocks trading at large discounts to their fair values receive the highest ratings (4 or 5 stars). Stocks trading at large premiums to their fair values receive lower ratings (1 or 2 stars). A 3-star rating means the current stock price is fairly close to the analyst's fair value estimate. Sharpe Ratio uses standard deviation and excess return (a measure of a security or portfolio’s return in excess of the U.S. Treasury three-month Treasury Bill) to determine the reward per unit of risk. Standard deviation is a statistical measure of the volatility of the security or portfolio’s returns. The larger the standard deviation, the greater the volatility of return. The Stewardship Rating represents Morningstar’s assessment of management's stewardship of shareholder capital, with particular emphasis on capital allocation decisions. Morningstar analysts consider companies' investment strategy, history of investment timing and valuation, financial leverage, dividend and share buyback policies, execution, management compensation, related party transactions, and accounting practices. Corporate governance practices, such as poison pills and staggered boards, are only considered if they've had a demonstrated impact on shareholder value. Morningstar analysts assign one of three stewardship ratings: "exemplary", "standard", and "poor". Stewardship is judged from an equity holder's perspective. Ratings are determined on an absolute basis. Companies are judged not against peers within their industry, but against ideal stewardship of shareholder capital. Most companies will receive a standard rating, and this should be considered the default rating in the absence of evidence that a management team has made exceptionally strong or poor capital allocation decisions. The Morningstar Style BoxTM reveals a fund’s investment strategy as of the date noted on this report. For equity funds, the vertical axis shows the market capitalization of the long stocks owned, and the horizontal axis shows the investment style (value, blend, or growth.) A darkened square in the style box indicates the weighted average style of the portfolio. For fixed-income funds, the vertical axis shows the credit quality of the long bonds owned and the horizontal axis shows interest-rate sensitivity as measured by a bond's effective duration. Morningstar seeks credit rating information from fund companies on a periodic basis (for example, quarterly). In compiling credit rating information, Morningstar accepts credit ratings reported by fund companies that have been issued by all Nationally Recognized Statistical Rating Organizations. For a list of all NRSROs, please visit: U.S. Securities and Exchange Commission. Additionally, Morningstar accepts foreign credit ratings from widely recognized or registered rating agencies. If two rating organizations/ agencies have rated a security, fund companies are to report the lower rating; if three or more organizations/agencies have rated a security, fund companies are to report the median rating; and in cases where there are more than two organization/agency ratings and a median rating does not exist, fund companies are to use the lower of the two middle ratings. Please Note: Morningstar, Inc. is not an NRSRO nor does it issue a credit rating on the fund. NRSRO or rating agency ratings can change from time to time. For credit quality, Morningstar combines the credit rating information provided by the fund companies with an average default rate calculation to come up with a weighted-average credit quality. The weighted-average credit quality is currently a letter that roughly corresponds to the scale used by a leading NRSRO. Bond funds are assigned a style box placement of “low,” “medium,” or “high” based on their average credit quality. Funds with a "low" credit quality are those whose weighted-average credit quality is determined to be less than “BBB-“; "medium" are those less than “AA-“, but greater or equal to “BBB-“; and "high" are those with a weighted-average credit quality of “AA-“ or higher. When classifying a bond portfolio, Morningstar first maps the NRSRO credit ratings of the underlying holdings to their respective default rates (as determined by Morningstar’s analysis of actual historical default rates). Morningstar then averages these default rates to determine the average default rate for the entire bond fund. Finally, Morningstar maps this average default rate to its corresponding credit rating along a convex curve. For interest-rate sensitivity, Morningstar obtains from fund companies the average effective duration. Generally, Morningstar classifies a fixed-income fund's interest-rate sensitivity based on the effective duration of the Morningstar Core Bond Index, which is currently three years. The classification of Limited will be assigned to those funds whose average effective duration is between 25% to 75% of MCBI's average effective duration; funds whose average effective duration is between 75% to 125% of the MCBI will be classified as Moderate; and those that are at 125% or greater of the average effective duration of the MCBI will be classified as Extensive. For municipal-bond funds, Morningstar also obtains from fund companies the average effective duration. In these cases, static breakpoints are used. These breakpoints are as follows: (i) Limited: 4.5 years or less; (ii) Moderate: more than 4.5 years but less than 7 years; and (iii) Extensive: more than 7 years. In addition, for non-U.S. taxable and non-U.S. domiciled fixed-income funds, static duration breakpoints are used: (i) Limited: less than or equal to 3.5 years; (ii) Moderate: more than 3.5 years but less than or equal to 6 years; (iii) Extensive: more than 6 years. Interest-rate sensitivity for non-U.S. domiciled funds (excluding funds in convertible categories) may be measured with modified duration when effective duration is not available. Operating Margin captures how much a company makes or loses from its primary business per dollar of sales. It is calculated by dividing operating income or loss by sales. The Price/Earnings Ratio (or P/E Ratio) for a portfolio is the weighted average of its stock holdings’ P/E ratios. The P/E ratio of a stock is the stock’s current price divided by the company’s trailing 12-month earnings per share. A high P/E ratio usually indicates the market will pay more to obtain the company’s earnings because it believes in the company’s abilities to increase their earnings. A low P/E ratio indicates the market has less confidence that the company’s earnings will increase, however value investors may believe such stocks have an overlooked or undervalued potential for appreciation. The Price/Fair Value Ratio (or P/FV Ratio) for a portfolio is the weighted average of its stock holdings’ price/fair value ratios. The price/fair value ratio of a stock is the stock’s current price divided by a Morningstar analyst’s estimate of the company’s worth. The Price/Sales Ratio for a portfolio is the weighted average of its stock holdings’ Price/Sales ratio. Price/Sales ratio is a stock's current price divided by the company's trailing 12-month sales per share. Price/sales represents the amount an investor is willing to pay for a dollar generated from a particular company's operations. Return on Equity is the percentage a company earns on its total equity in a given year. The calculation is return on assets times financial leverage. Return on equity shows how much profit a company generates on the money shareholders have invested in the firm. Return on Invested Capital is the percentage a company earns on its invested capital in a given year. The calculation is net operating profit after tax divided by average invested capital. The resulting figure is then multiplied by 100. Invested capital equals the sum of total stockholders’ equity, long-term debt and capital lease obligation, and short-term debt and capital lease obligation. Return on Invested Capital shows how much profit a company generates on its capital base. Revenue is a measure of how much money a company has brought in within a given period. Revenue Growth represents the percentage growth in a company's revenue over either the trailing 12 months or the trailing three years. Revenue growth gives a good picture of the rate at which companies have been able to expand their businesses. All things being equal, stocks with higher revenue growth rates are generally more desirable than those with slower revenue growth rates. A sector is a company’s general area of business. Morningstar divides stocks into 11 sectors according to their primary business, grouped into three larger Super Sectors. The Communication Services, Energy, Industrials and Technology sectors make up the Sensitive Super Sector; Healthcare, Consumer Defensive and Utilities make up the Defensive Super Sector; and Basic Materials, Consumer Cyclical, Financial Services and Real Estate form the Cyclical Super Sector. Because sectors can differ greatly in their characteristics, comparing a stock with its sector rather than the market as a whole is generally a better way of putting it in the proper context. Style % is a derivation of the Morningstar Style Box that reveals a plan’s investment strategy. For equity holdings, the vertical axis shows the market capitalization of the stocks owned and the horizontal axis shows investment style (value, blend, or growth). For fixed-income holdings, the vertical axis shows the average credit quality of the bonds owned and the horizontal axis shows interest rate sensitivity as measured by a bond’s duration (limited, moderate, or extended). The boxes contain the percentage of stocks in the portfolios that fall in that box. Total Return, or "Non Load-Adjusted Return", reflects performance without adjusting for sales charges (if applicable) or the effects of taxation, but it is adjusted to reflect all actual ongoing expenses and assumes reinvestment of applicable dividends and capital gains. Total returns for periods longer than one year are expressed in terms of compounded average annual returns (also known as geometric total returns). If adjusted for sales charges and the effects of taxation, the performance quoted would be significantly reduced. Relative total return indicates how a portfolio has performed relative to its peers (as measured by its Benchmark Index) over the time periods shown. The Total Cumulative Return graph shows the effect of the market value change of a portfolio, individual security, and/or index over specific time periods. The cumulative return is the percentage increase or decrease of a portfolio or security since its initial purchase. Yield is the annual dividend per share divided by the current stock price.